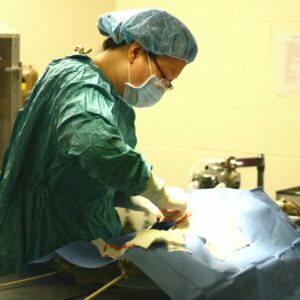 All of our surgeries include a pre-surgical exam to assess for any abnormalities that may change your pet’s anesthesia. We highly recommend pre-surgical bloodwork to screen for kidney and liver disease, diabetes, and anemia. Pets older than 7 years old are required to have bloodwork within 6 months of their procedure. We also recommend IV (intravenous) fluid therapy for any pet undergoing surgery. The doctor may require IV fluids for certain procedures or geriatric patients. We have a wide array of surgical anesthetics. After analyzing your pet’s history, physical examination, and bloodwork, a veterinarian will decide on the safest anestetic plan for your pet. Isoflurane, one of the safest anesthetic gases, is the only inhalent anesthesia used at our facility. A trained technician or doctor monitors your pet during the entire time they are under anesthesia. If we determine your pet needs to have surgery, we will provide you with an estimate for costs of surgery, anesthesia, and medications. We strive to be as accurate as possible, but we are not always able to predict all possible outcomes while your pet is under anesthesia. If your pet was seen elsewhere, we require an examination before making an estimate for their procedure. There are often too many variables to make an accurate estimate on patients we have not seen.